The first impression about myhomeworkhelp.com is that the service has a very flashy design. It is like an owner of the company has hired some newby designer and told him, "Listen, boy. I am gonna run an online writing business, and I need a very bright design because students will visit it and they like everything colorful... And you need to make it clear that we have experts who fluently speak and write in English... And one more thing, there should be a live chat, that is a must." The designer silently nodded his head and made the main page which looks like this. 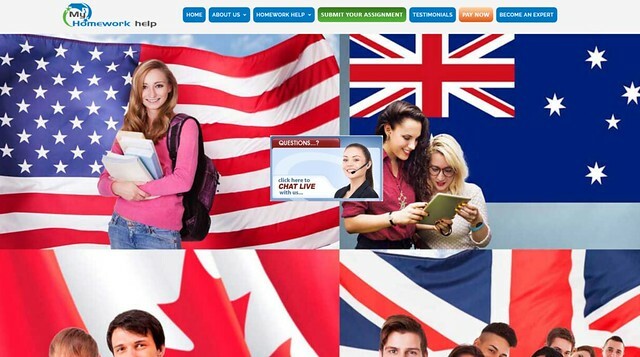 Yes, there is a live chat in the middle of the main page, and there are plenty of students and flags of English-speaking countries. Everything to ensure you and me that this is a website which specializes in writing assignments in English. Ok, that was my little poetic note, and I cannot build my review solely on the bad design of the company's main page. Nevertheless, according to my observations, bad design is often the first sign that a company does not care a lot about its image. I didn't find any information about the company's location or how many years they are in business. Only some standard phrases that you can find almost on every second writing service. Writers from All Over the World or We Hire Non-ENL "Experts"
MyHomeworkHelp assures that they have 676 fulltime and 982 part-time subject-specific online experts. That is a direct quote that I found on the About Us page. They also state that EACH expert has a BS, MS, MBA, CA, CPA or PhD degree and at least 5 years of experience of providing homework solutions. I have to admit that it is very bombastic rhetoric, and if it is at least half true, then I found a truly great writing service. By the way, when I asked about English speaking writers, I got an answer "We hire writers from all over the globe." It means that not all their writers (if any) are native English speakers. As I discovered through communication with a customer agent, they provide typical writing package of services. You can order an essay, a research paper, a term paper, and any other type of work you need. There is no list of prices on this website. 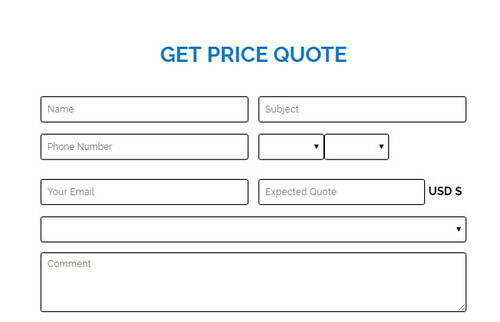 If you want to know a price for your paper, first you need to provide all the details, and they will send a message to your email address where they indicate how much your order will cost. I requested an essay with the longest possible deadline of 14 days, and they told me it would cost me $16. Do not expect to receive any bonuses for newcomers or a long-term discount system that will help you save some money on future orders. None of these can be found on myhomeworkhelp.com. 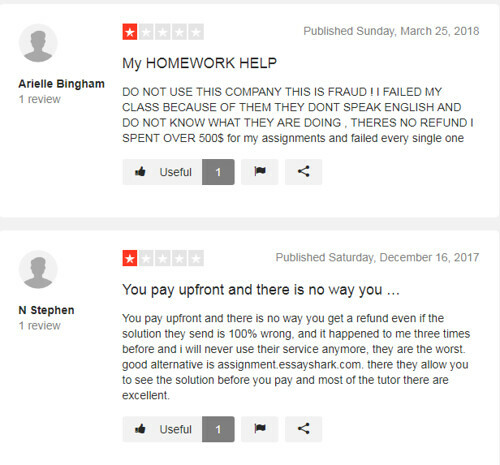 I was not surprised when I found a lot of negative My Homework Help reviews. There were also good ones, but those which were full of anger and hatred included some specific argumentation like a refund policy. Oh, yes that is a very interesting issue. Read it in the following sections. You will be very... surprised... is it a good word for it? Not sure. Nevertheless, it's worth reading. Talking about online reputation, you will find a lot of comments link the one I attached below. And I believe them because I clearly see that this company is far from being a good service. You know, usually, in this section, I have nothing to say except for "The customer support agent was friendly and helpful". Even those companies which do not seem like the best place for seeking writing help, usually have a great customer support team. And at some point, I started thinking that the Customer Support part of my review is useless since I often write almost the same things. That's what I thought until this day - the day I visited myhomeworkhelp.com. First thing I didn't like is that you have to fill FOUR required fields to contact a manager. And one of them was email ID. 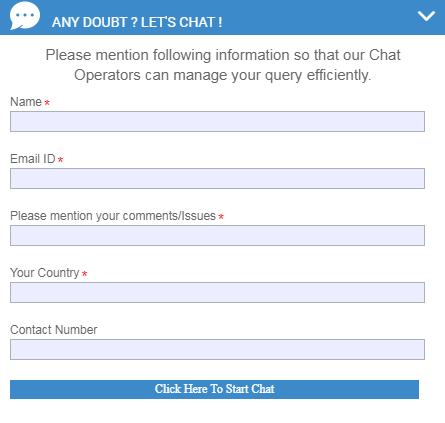 Why should I provide my email address if I want to clarify a couple of issues before deciding whether I want to get assistance from this company or not? So I made a fake name and started chatting with a support manager. From the first reply, I understood that I was going to get a very interesting experience of communication with a support agent. I didn't even ask a question, I only asked for permission to address a couple of questions about the company, and I got a bit rude answer which you can see below. WTF was that? Are you serious? The customer support manager has just told me that she had other customers and she had no time for me. Really? That is your JOB. I don't care that other customers need assistance right now. That is the company's business to hire enough agents to help each and every client. Who will help ME right now? Who will answer all my questions and dispel any doubts that I have? I don't know what more to say about the quality of the customer support job. It is the WORST that I've ever seen. If there is a reward for the rudest and the most awful customer agent assistance, I would give it to myhomeworkhelp.com. Actually, this kind of attitude was enough for me to leave the site and find writing help somewhere else. Indeed, I lost any desire to hire a writer here. As for guarantees... Well, I didn't expect to read here something that would encourage me to trust myhomeworkhelp.com. And I was goddamn right. I found a guarantee that this company does NOT provide refund in any case. They write about it directly in terms and conditions. If you get a bad-quality work, they will (I hope) revise it, but you will never get your money back. As for me, it is a real guarantee that a service cannot deliver quality papers and thus, they use this precautionary measure to avoid financial loss. Is My Homework Help legit after such a claim? Why not, they have warned you. Whether you should rely on them is a different question. If you still have a desire to place an order on this website, I will explain to you how to do it. Well, it is not as simple as I am used to. They do not have a standard order form which you can find on any normal essay writing service. Myhomeworkhelp.com decided to make simple things more complicated. So, let me proudly present you the quote form. In the fields you see above, you have to provide information about yourself and the order. There is no field to enter the number of pages, amount of sources, writing style, and other important things. I believe you have to write it in the comment field. Once you submit it, you will receive a message to your email address with an estimated price. However, if the price is too high, you have to repeat a procedure one more time and wait again until you get a notification. As for me, it is a far too complicated way to place an order which steals the customers' precious time for nothing. I will be honest with you. This myhomyworkhelp review will not contain the paper quality analysis. I found too many pieces of evidence which made me believe that I would not receive a quality paper here. I may be mistaken, but that is the impression I have after visiting myhomeworkhelp.com. Extra features? Well, they do not even have a standard order form with the standard ones. What extra feature do you expect to find on a site like this? I know, any would do. 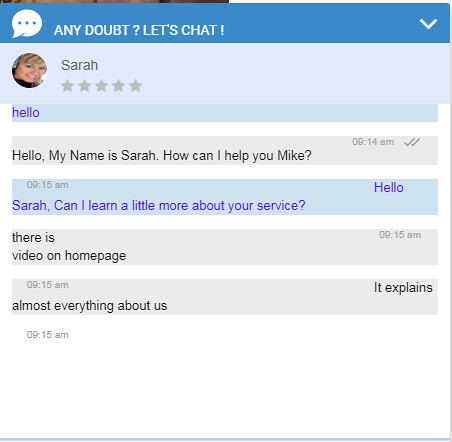 My final word about myhomeworkhelp.com starts with F... and it is FORGIVE me for wasting your time on reading this myhomeworkhelp.com review. I visited many writing services websites. Some of them were good, others were bad. There were also very bad companies, but this one kicked it up a notch. I have never had such an awful experience. Everything was bad, from the customer agent to the order form. My opinion, I would never seek quality academic assistance on a site like this one. But that is my opinion which is based on my personal perception and expectations. Sorry, guys, I don't know what to say. That's all, folks! I have nothing more to say about myhomeworkhelp.com. I hope you don't have any bad experience if you decide to order papers on this site.